I think everyone should use at least a 30-06. 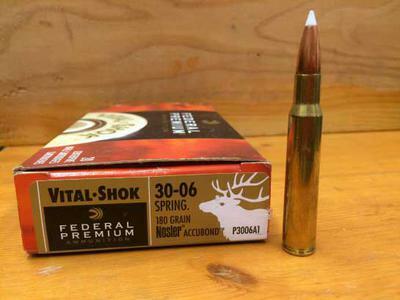 I used to use Sierra 180 grain SPBT bullets but I had a bad experience once, with a bullet that disintegrated when it hit the spine of a moose. The shot unfortunately was not good, it was too high! The shot was on a running animal at about a hundred yards. After the shot the moose continued to run until I lost sight of it in the forest. I waited a considerable time before I approached where the moose had ran into the woods, and as I neared the area where I had expected to find the animal I heard the moose crashing through the forest in a hasty retreat. Oh how my heart sank at the sound. Upon investigation I found where the moose had laid down, there was some blood (not much). I tried to track it, but there was no blood trail and there were too many moose tracks to figure out which way he went. My partner and I searched for well over three hours... no moose. I was sick. The next day I hunted a beaver pond about 2 miles from this spot and as I sneaked in to the spot I see a nice bull moose standing broadside. I take a good rest and shoot right through the vitals and he dropped in his tracks. Happy, yes, but sad at the same time that I may have a wounded or dieing moose running around in the area. Wouldn't you know it when I get to the moose I can see it has an injury on its back. It was the same moose. I swore from that point I would switch to Nosler bullets for better performance. Since that time I have never had a moose get away. Nice job on the website! Lots of great information.